Do you want to export all of your Virtual Machine information like CPU count, Memory and VHD sizes from your Hyper V environment and can’t find anywhere on your Virtual Machine Manager an option to do it? 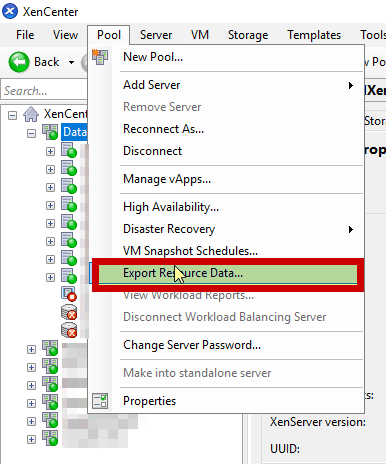 In Citrix Xen Center this is quite easy all you need to do is to go to the Pool Menu -> Export Resource Data and there you go. In HyperV this is not as easy as that as it is not available via the Virtual Machine Manager, you will need to do it in Powershell! While its not as easy as how you do it in Citrix, you can get a tons of information from it and you can export it in any way you want. And if you are not well versed in Powershell I provided you the script below to follow, all you need is to run this where your Virtual Machine Manager is installed and change the “YOURHOST” with just a wildcard to get everything or what ever Host Name you want to run your report to.